Is there really such a thing as too many outboards? 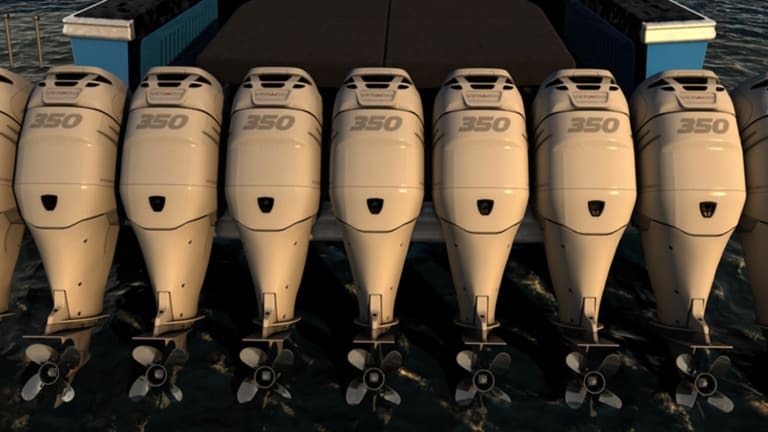 How do you decide how many outboards your next boat should have? It’s no secret, I’m a fan of outboards. While they’re not appropriate for every application, their outstanding power-to-weight and power-to-size ratios are two compelling reasons to consider them as alternatives to straight inboards and stern drives. And alot of people are doing just that. 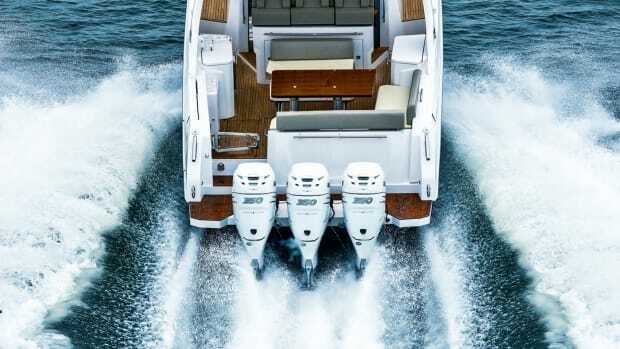 At every boat show I attend, I see large, sophisticated vessels that in the past probably would have been powered by stern drives or inboards instead sporting large outboards—not just twins but triples, quads, and even quintuples. And that brings up an interesting question for anyone considering a switch to outboard power. 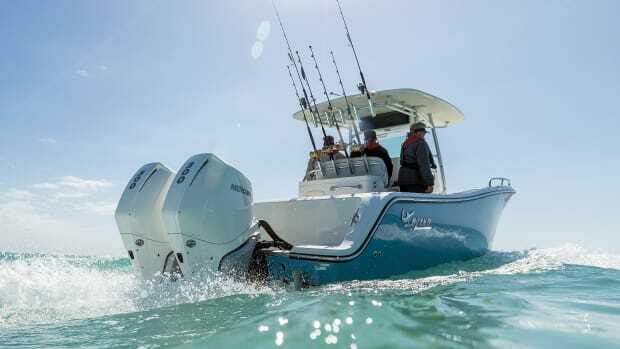 Which is better: fewer big outboards or more smaller ones? You can’t answer that question until you define “better.” I’ve spoken to a number of boat-show boaters considering big-outboard power, and one thing I’ve learned is that their motivations involve more than mere logic. Quite a few are looking for a boat that’s not only fast but also makes a statement. To some that means a pair of refrigerator-size engines, to others it’s a gaggle of motors crammed shoulder to shoulder. I’m not about to say which is better in terms of aesthetics, but I can offer observations of a more logical nature—assuming logic has any role to play in spec’ing out a boat with well over 2,000 horsepower hanging off the transom. The logic here is the same that a more sober individual would apply to any boat, be it a staid long-distance cruiser or a workaday shrimper. It’s all about balancing efficiency and reliability. 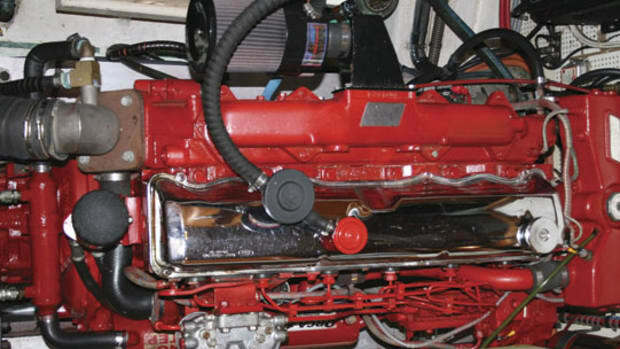 If you’ve spent time around commercial boats, you’ve no doubt noticed that almost all of them have just one engine. Two reasons for this are lower initial cost and less space dedicated to mechanicals, leaving more room for things like stowage and tankage. But there’s an even more important reason, and that’s efficiency. A single engine is simply more efficient than multiples. The principal reason is hydrodynamic drag. 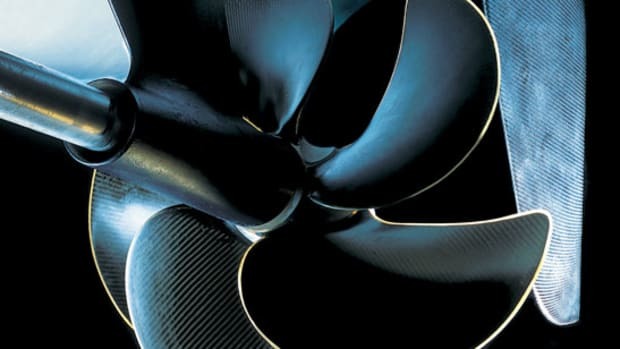 Anything that protrudes from a hull slows it down, and that includes struts, shafts, and yes, even the lower units of stern drives and outboards. As you’d imagine, the more stuff, the higher the frictional penalty. Of course, you might also imagine that when we’re considering multiple outboards, the increment in wetted surface incurred by adding an outboard is so small as to be insignificant. Well, that depends on what you mean by insignificant. A ten-percent decrease in efficiency probably means little to a recreational boater, but to a guy who’s on the water every day trying to earn a living, it’s big. The question that logically follows then is exactly how much drag does the addition of each lower unit create, and to that I’m afraid I have no answer. I can’t find any research quantifying the loss of efficiency as additional drive units are applied. 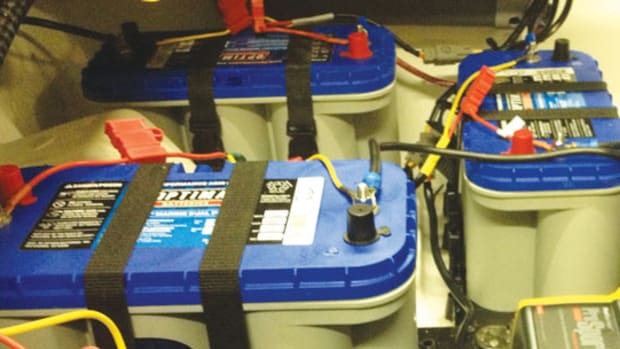 The whole matter is muddied by the fact that any such research would have to compare differences based on a constant amount of horsepower—for example, two 500-horsepower outboards compared to five 200-horsepower outboards. 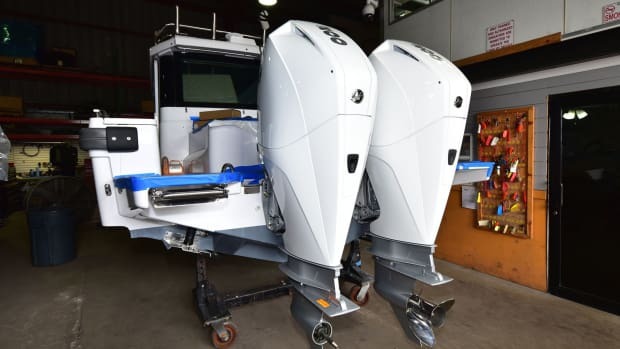 Also to be factored in: The size of the lower unit is a function of the size of the outboard, so a 500-horsepower lower unit will present more wetted area than a 200-horsepower one. Suffice it to say that for the average boater, the difference in efficiency is probably not going to be a major consideration, especially at today’s fuel prices. But the difference in speed might be a big deal. 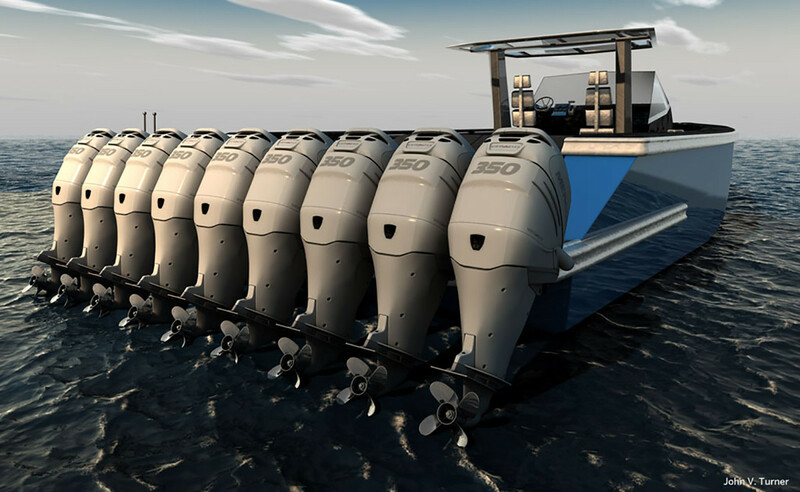 Due to their additional drag, more outboards will produce less speed per horsepower than fewer outboards. Or to put it another way, a given amount of net horsepower will produce less speed as you add engines. 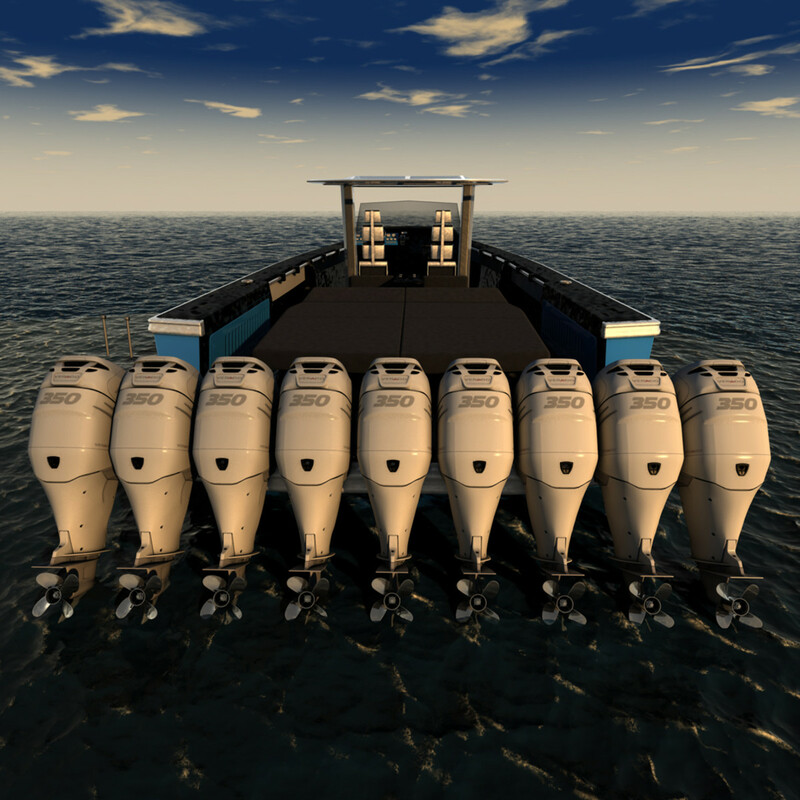 So a boat powered by a single 300-horsepower outboard will go faster than the same boat powered by two 150-horsepower outboards. When I asked various engineers and boat designers to quantify the difference, I got answers varying from five to 15 percent. Consider two other factors. One is initial cost. Generally speaking, the more outboards you purchase to produce a given amount of horsepower, the more it will cost you. The reason is simple: You’re purchasing a lot more stuff—pistons, gears, blocks, etc. 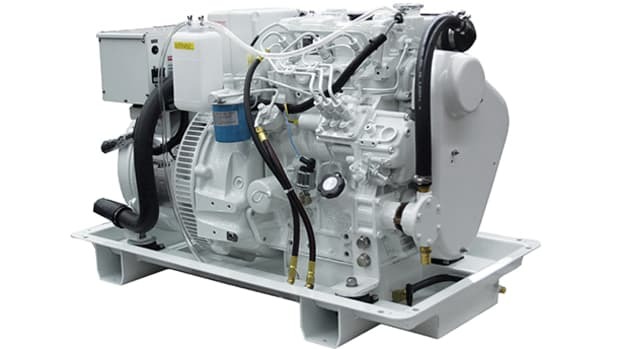 You’re also absorbing additional costs for ancillary equipment such as fuel-delivery systems, steering gear, and instrumentation. Then there’s reliability. 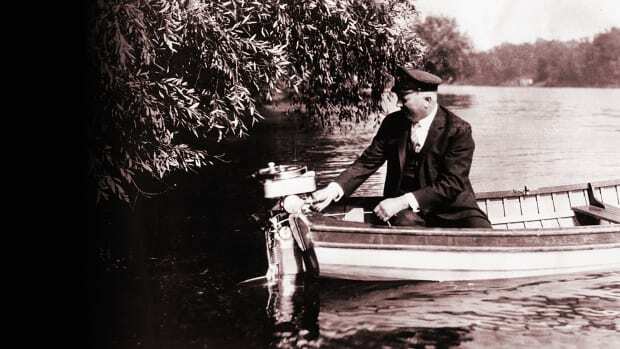 Today’s outboards may excel in this regard, but like anything mechanical, they will eventually break. Logic argues that the more parts there are, the more likely it is that something will go awry. 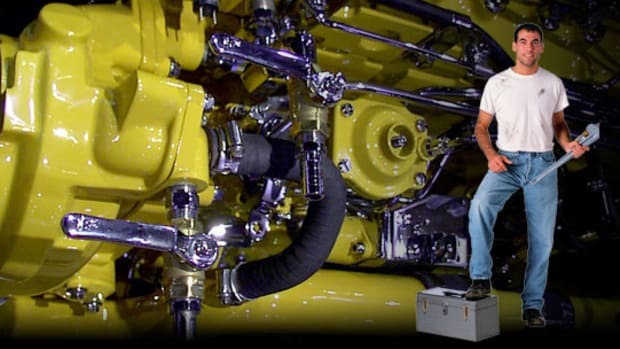 Ergo, more engines means more potential headaches and higher maintenance costs. That’s another reason why most commercial guys have just one. Do these concerns really matter? Not if speed and looks are the big draws. You can’t deny the visual impact of five outboards. Time for a New Outboard?